The stadium seats almost 20,000 people and when England play here, the atmosphere is fantastic. It’s one of the friendliest grounds we’ve been to in the UK and the food and drink facilities are good. There’s not really a bad seat in the whole stadium, so wherever you get tickets for, you’ll get a decent view. It’s not just England who have played here either, as Trent Bridge was a host ground for the Cricket World Cup a few years ago. The best way to experience Trent Bridge is to get a ticket for a game. 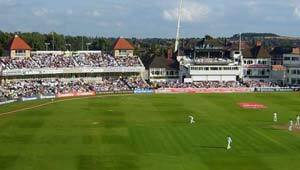 Tickets to see the county side, Nottinghamshire, play are available from the Trent Bridge website and are much cheaper than seeing the national side,England, play. Tickets for national and international fixtures are also available at the same website, but you will also be able to buy these from a variety of further websites too. We do not recommend that you buy tickets from people outside the ground. Trent Bridge is on the A60 just near the River Trent and is around a 25 minute walk from Nottingham city centre. Regular bus services are available too.